The city Department of Planning and Development has been working for some time on a Downtown Circulation Plan. Signs of the plan are visible already on city streets, Washington Street was made two-way, and the lights at Washington and Empire are built for the future transformation of Empire into a two-way street. Eventually, Weybosset will be made a two-way street as well. A large part of this plan will involve LaSalle and Emmett Squares near the Convention Center. The city has secured funding and plans to move forward with the redirection of Empire and the redesign of LaSalle Square next spring. Below are conceptual drafts of the planned redesign of LaSalle Square. Please note, there is a key part of the plan that has changed that is not reflected on these drafts. In the final plan, Empire will be two-way straight through LaSalle Square to the intersection of Sabin Street and Broadway. The city originally wanted this, but RIDOT was originally reluctant to allow two-way traffic through the center of the square. 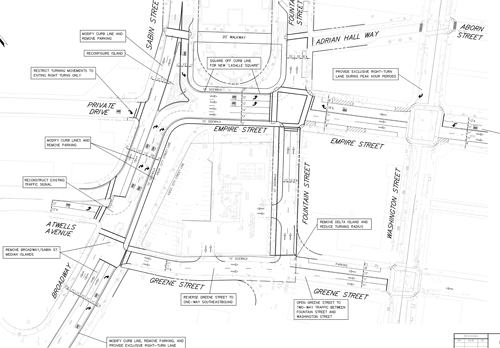 RIDOT now agrees that Empire should be two-way through the square, and new plans are being drawn up to reflect that. 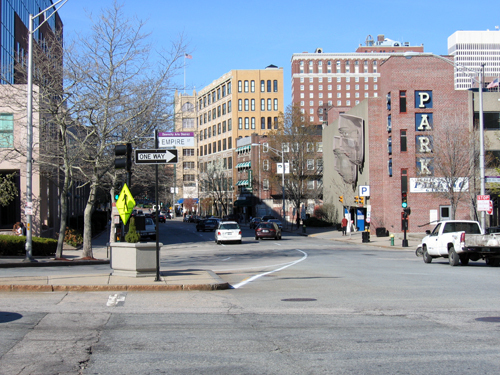 The first project will be making Empire Street two-way between Weybosset/Broad and Washington Streets. The angle parking in front of AS220 will be eliminated (currently it faces the wrong way for a two way street), parallel parking will replace it on both sides of the street. Following the establishment of two-way traffic on Empire, work will commence in LaSalle Square. The open space in front of the Blue Cross Blue Shield Building (sometimes known as AT&T Plaza for the building’s former tenant) will be squared off, the rounded edges of the square, which now allow for highspeed traffic movements, will be extended to create a proper city block edge to the square. The city war memorial, which was located outside the Dunk prior to construction, is currently in the process of being reset in the current footprint of LaSalle Square. There were some whispers a while ago (before the economy plunged off the cliff) that the new owners of the BCBS building were contemplating putting retail in the ground floor of that building. Retail at this location (dependent to a degree on what kind of retail) would reinvigorate the square drawing in foot traffic and perhaps encouraging passive use of the open space. Let’s hope the retail plans are able to move forward. The Empire Street section that moves through the square (in the final concept will be two-way, but shown as one-way in the attached drafts) will be lined up to create a proper street wall. The sidewalks in front of the library at one end will line up with the sidewalks at the end of Aborn Street behind the Hilton at the other end. This will create a proper street wall along the length of Empire Street. Of course, until and unless The Procaccianti Group ever builds their Empire at Broadway proposal (or something else gets proposed and built), the street wall will remain a concept only. Currently Greene Street runs westbound heading toward Broadway. Greene Street will be turned around and will now run eastbound from Broadway to Fountain Street, then will be a two-way street from Fountain Street to Washington Street (and I assume on to Broad Street and into the Jewelry District eventually). This will allow Broadway traffic heading southeast toward Broad/Weybosset and the Jewelry District to use Greene Street and avoid LaSalle Square and Empire Street entirely. Broadway features an exclusive right turn lane onto Greene Street for this purpose. It is not clear from the plans, but traffic from Atwells should also be able to make a quick right then left onto Greene Street to head east toward the Jewelry District. In my Sim City visions for the city, Greene and Atwells would both be shifted slightly to allow them to meet directly at Broadway as a proper crossroad, encouraging eastbound Atwells traffic to continue down Greene Street. In the real world this would require land swaps or takings, certainly not impossible as the affected properties are currently unbuilt, but a hurdle to cross none-the-less. Broadway between LaSalle Square and the highway goes on a diet. Currently there is a traffic island at the Atwells intersection and a wider island approaching the square. These islands go away, and the northbound (toward the square) lanes on Broadway are pulled in. This changes the feel of Broadway from what currently feels like an expressway construct to a city street construct. Opposing traffic having a yellow line separating it, rather than an island, encourages the traffic to move slower than segregated lanes. Fountain Street also goes on a diet (see the full plan for Fountain Street here ). Currently Fountain Street is 3 or more lanes between LaSalle and Emmett Squares. The new proposal makes Fountain two-lanes with angled parking on left side and parallel parking on the right. At the Fogarty Building, the sidewalk would be pushed out into what is now the street allowing for a larger footprint for the redevelopment of that parcel (a project that is currently stalled). The small piece of Mathewson Street that runs between the Fogarty and Journal Buildings will be made two-way as part of the redesign. This coupled with the two-way traffic movements on Empire through LaSalle Square eliminates the need for the u-turn from Fountain onto Sabin at Emmett Square, as most traffic now has two opportunities to make that movement. As plans for Emmett Square are finalized, we’ll see the benefit of removing that u-turn from Emmett Square. Currently, there is a walkway from Aborn Street across Fountain, through the square, across Sabin, to the Dunk. This walkway will be maintained and the city is figuring whether or not to put raised crosswalks for this walkway on Sabin and Fountain. I encourage the city to say yes to these raised crosswalks and to eliminate the traffic light on Fountain that is supposed to serve this crosswalk (the one at Sabin is already gone, through design or neglect I’m not sure). The raised crosswalks will force traffic to stay at reduced city speed on both Fountain and Sabin (slowing traffic on Sabin entering the square) and allow pedestrians a better path across these streets. At Empire and Fountain (outside the library and Trinity Brewhouse) I would like to see the use of curb extensions to prevent cars from parking in the crosswalks and reduce the gap that pedestrians need for crossing Empire Street. But what about the parking?!? I can’t believe I’m bringing this up, and I can’t believe what my opinion is on this subject, but a lot of street parking goes away in this plan, some legal, and some that is not legal but is used as habit (such as people parking all over LaSalle Square during events at the Dunk). The non-legal habitual parking I’m not worried about, and wish parking would be enforced now, but there’s a lot of spaces on Greene, parts of Fountain, and Broadway that are disappearing. Almost all the street parking on Greene Street between Broadway and Washington goes away, and that is a significant amount of parking for people patronizing places such as Trinity (both the Brewhouse and the theatre), Bravo, AS220, and others. I don’t think Greene Street actually needs to be two-lanes eastbound between Broadway and Washington. Westminster works perfectly fine as a one-lane street with on-street parking. Greene should be reduced to one-lane eastbound with the proposed second lane devoted to parking. If the TPG proposal for the Old Public Safety Building lot is ever built, the proposal was to put the garage entrances on Green Street, which could put more pressure on a one lane Greene Street. This could be addressed, when and if the building is ever built, by restricting parking at the rush hours (when office tenants will be entering and leaving the garage) and allow for parking midday, during the evenings, and on weekends when people are patronizing the destinations I listed above. Again, like Greene, all the parking on Fountain Street between Greene and Empire goes away in this plan, and Fountain is a two-lane street. Again, like Greene, I’m not convinced this part of Fountain needs two lanes. Again, the solution could be to restrict parking at the rushes or allow parking only in the evenings and on weekends. Parking is also eliminated on the portion of Broadway fronting the Public Safety Building lot. This is a minimal number of spaces, but contributes to downtown parking needs. The issue I have with eliminating street parking here is that street parking is also a street calming device. Traffic moving past parked cars tends to slow down, as opposed to traffic moving down a street without parked cars. Also, parked cars provide a barrier between pedestrians and moving traffic. I would encourage street parking on Broadway between Greene and just short of the square. I wonder if they’re eliminating parking based on the mayor’s streetcar pipe dream. I guess my big question is why is there no plans for dedicated bike lanes? My general impression is that the layout of these city sections makes for smoother travel flow for cars but also makes it more difficult for cyclist given all the dedicated turning lanes etc. As for pedestrians it makes it slightly better but again very little accommodation has been made to improve the area for them either. The city spent plenty of money putting up signs indicating bike routes but no on street markings that MIGHT get even a cursory glance from the typical motorist. It feels like a missed opportunity much like all of the re-striping done on waterman and angel streets. I agree about the Greene Street parking and lanes. It looks like some of the parking losses on Empire would be offset or increased by the angled parking on the left side of Fountain. I’m having trouble envisioning how the intersections will look with Empire 2-way all the way to Sabin/Broadway. That would imply to me that the triangular median would have to be eliminated to accommodate the left from Empire to Broadway. These plans are a disappointment and a missed opportunity that comes right out of the highway planners and to some extent the New Urbanist playbooks. There are positive ideas in the plans, such as creating a larger building site for Fogarty Building, removing the Broadway/Sabin St. medians and narrowing the street, and enlarging the former police headquarters site. The 20′ walkway is a great idea and the former AT&T plaza could either continue as a landscaped pedestrian open space or become a separate building lot. However, why when speed limits are 25 mph, is it necessary to design traffic lanes to be 12 or 13 feet wide? A 12 foot lane width is standard for highways with speeds of 55 or 65 mph. The proposed 10 foot wide sidewalks are not a groundbreaking improvement. They’re just the bare minimum. When street tree pits and street furniture are added the effective open sidewalk width will be something more like 6 or 7 feet wide, which is fairly substandard. When the city evolved the original sidewalks were narrow. There was never any expectation that downtown streets would be tree lined. The angle parking will visually dominate the streetscape with cars. Angle parking is something more typical of a suburban or small town main street, not a feature that would be expected in a central city. Even if this were an acceptable concept, the detailing with painted angle-striping over asphalt instead of landscaped curb bump-outs is crude and a poor choice. Both plans are heavily auto-centric. Pedestrians seemed to be viewed are a marginal accessory and bicycles are irrelevant. Currently there are outstanding examples developed by NYCDOT along with Jan Gehl an architect from Copenhagen with New York’s new “shared streets” where pedestrians, bicycles, and landscape are blended beautifully as vehicles with few conflicts, inexpensively. Perhaps, DPD and RIDOT should visit Manhattan to see how these streets work or the maybe the city should hire Gehl as a consultant to get the best design for everyone. Coryndon, I agree the city hasn’t been doing as well as we’d all like in accommodating bikes. However, I personally think full exclusive bike lanes can’t be the answer in Downcity Providence. Our streets are too small and in most areas there is not room for exclusive bike lanes. I also worry about forcing bikes into their own lanes in too many areas, it conditions motorists to think bikes should stay in their lanes and are out of bounds anywhere else. In urban environments, having exclusive bike lanes often ends up forcing cyclists into the door zone of parked cars. In some areas of the redesigned 195 land, sharrows are being introduced. The sharrow marks that the road is a bike route and that cars and bikes should be expected to share it. I think in this area, as the proposed bike lanes on the west end of Broadway carry across the highway, they should transition to sharrows. I don’t like the exclusive right turn lane from Broadway onto Greene because I’m generally against exclusive right turn lanes in cities (I don’t see the necessity) and it interrupts bike traffic flow. I would get rid of that lane. Though as Matt says, if I were biking on Broadway and wanted to end up on Fountain, I’d use Greene to get there, a left off Greene is better than trying to turn left off Empire. Matt, the triangle at Sabin/Broadway/Empire does go away now that Empire will be two-way straight through. To my mind there are two things that could be done with that intersection. I think what the city/RIDOT plan is, would be to have Empire end at a T-intersection with Broadway/Sabin. It seems a complicated intersection with a lot of light movements to get all the turns through. Looking at it, I think that Broadway/Empire could be a two-way through street (sharing a light movement where they would have no turns, just straight into each other), and Sabin could end at a T-intersection. Sabin would then make Broadway/Empire turn red so Sabin could have a green light for left and right turns. This seems less confusing and easier for pedestrians to understand when it is their turn to cross. After giving it more thought, moving the street line to provide for an enlarged Fogarty building lot would be destructive to the Fountain Street street-wall. Since the current proposed development on the block is parking garage, it would be complete waste of such a prominent parcel. If the added lot area was restricted to only open space, then it could provide an opportunity for a more varied streetscape while maintaining the street-wall. If the city is insistent on developing angle parking throughout downtown, besides the aesthetics addressed previously, it might make sense using the Seattle angle parking model, which reverses the angle. Rather than pulling into an angle parking spot, Seattleites pull ahead of the angled spot then back in. The advantage, other than brushing up on backing-up skills, is that there’s no blind spot created either entering or pulling out of a space, though you rarely see this parking option in the heart of downtown Seattle. Another observation, RIDOT or the city actually designed some of the traffic lanes, both going in the same direction to be 15 feet wide each for parts of Fountain Street. This seems excessive. Rhode Island drivers aren’t that bad. The wider the lane the more speeding is encouraged. Jef, your comment about defined bike lanes is reasonable, but on a one-way like Fountain Street there’s plenty of room over several blocks to create one. Further, if bike lanes aren’t fairly ubiquitous throughout downtown then drivers are far less likely to take cyclist seriously. The city and especially downtown needs to remind the automotive public that the street is not exclusively theirs. I think what we are seeing here is the Planning Department’s vision as translated by RIDOT. I think you would find that the planners actually are very much aware of interesting and innovative design concepts that are coming out of other cities. It is RIDOT that is holding us back. Seeing as we are the most urban state in the country, it really behooves us to give RIDOT a kick in the pants and learn them on what city streets should look like, and most importantly, who they should serve (i.e. pedestrians, bikes, AND cars). It would probably be a good idea for the Planning Department to get some experts from around the country (and some Europeans while we’re at it) to come to Rhode Island and talk to RIDOT about the innovations they are implementing. Looking at the plan, lane widths are anywhere from 11 to 15 feet. Making all the lanes 11 or 10 feet would give multiple feet back to the sidewalks in many parts of this project area and I think it is certainly an issue that should be visited before final plans are completed. Sharrows and bike triggered lights would be fine if bike lanes are not appropriate. My main issue is that bike accommodation (in my very limited interaction with ridot) is an afterthought. My other impression is that getting any change specifically for bikes in the city is very hard (a-la the 5-10 year discussion of the blackstone blvd bikepath) so it makes it a priority from my perspective to see it accounted for in plans for any new expenditure, especially in limited economic times. Hell, even route six in Seeconk has bike sinage both on and off the road where it was reworked near Lowes and the number of cyclist there is basically nil. So when I don’t see sharrows added when the city re-stripes or reworks the sreets it just means that we are back to the “its too expensive for so few people” discussion which pits bikers against the powers that be. Jef, I think you’ve hit on it! The problem is RIDOT. I sincerely hope that the city planners and the Mayor’s office read this site. It looks as if we’ve got another planning emergency. Unlike Wickenden Street with Fox Point, La Salle Square doesn’t have a similarly cohesive or vocal constituency. Perhaps L+A Landscape Architects or another local landscape architecture or urban design firm might be interested in developing some alternate schemes that could be presented to officials. Proposals by out-of-state professionals might not be received as well, but could be an option also. Maybe a local foundation would be interested in kicking in some resources to offset some of the costs of this work due to the prominence of the location and importance of the issue. Will there be a hearing for the public to respond to these proposed plans. Janette Sadik-Khan the NYCDOT commissioner might be another expert the city could invite to Providence. She was the individual that brought Jan Gehl to New York. I am close to completing my own plan right now for La Salle Square that is a lot simpler than this proposed plan. I eliminated most of the one-ways and moved Atwells Ave and Green Street closer in order to form an intersection.